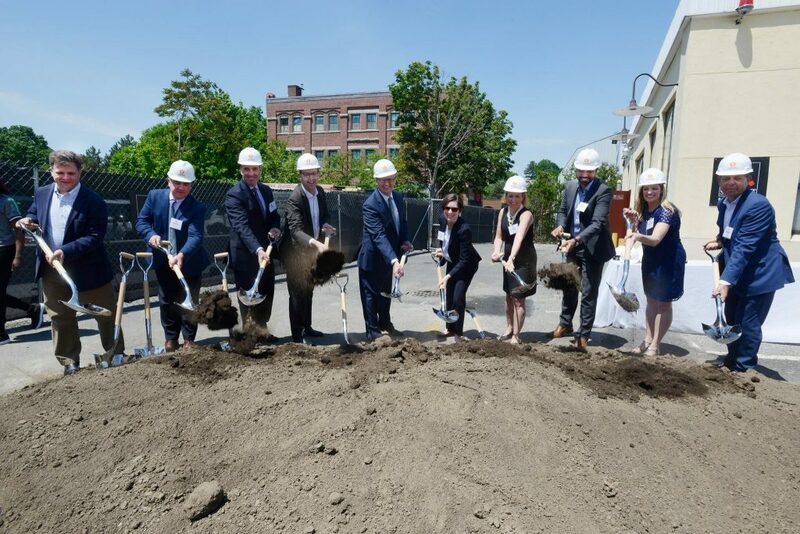 BOSTON (May 30, 2018) – Community Servings, a nonprofit provider of medically tailored meals and nutrition services to individuals and families living with critical and chronic illnesses, broke ground today on an expansion project that will broaden its caring mission and its leadership role in furthering the power of food as medicine. The $21 million “Food Campus,” now under construction on the site of Community Servings’ headquarters in Jamaica Plain, consists of a three-story addition and kitchen expansion in the existing space. The 31,000-square-foot project will enable the organization to triple the production of medically tailored meals to meet increasing demand, double the capacity for daily volunteers, and double the number of food service job training graduates. Community Servings hosted a groundbreaking ceremony with Boston Mayor Martin J. Walsh and Massachusetts Department of Public Health Commissioner Dr. Monica Bharel, along with other key philanthropic supporters of the Food is the Foundation capital campaign, which to date has surpassed 80 percent of its $10 million fundraising goal. This private capital combined with equity raised from New Markets Tax Credits, private debt from community development lenders, and funding from the City of Boston will pay for the construction and expansion of Community Servings. “We are proud of our decades-long relationship with Community Servings and look forward to seeing this important work reach more residents of Massachusetts in this new building and improve their health and the quality of their lives,” said Commissioner Bharel. • A Learning Kitchen that will accommodate up to 24 students for job training and nutrition classes, and include video capabilities for nutrition education seminars. • A Family-Friendly Volunteer Kitchen that will allow individuals of different abilities and families with young children to volunteer in meal preparation and packaging. • A Baking Kitchen that will produce desserts for special diet clients in-house, saving on the cost of purchased desserts while adding a baking component to the job-training program. • A Food & Health Policy Center that will focus on research into medically tailored meals and health care, and replicating the Community Servings model on a national scale. Community Servings has experienced a 40 percent growth in demand for its medically tailored meals over the last five years. At any given time, 50 to 150 people are on the organization’s waitlist. The need is expected to grow even more as health providers and insurers recognize how medically tailored meals can help improve patient health while reducing the cost of care for vulnerable people. The project is scheduled to be completed in the fall of 2019. Community Servings has engaged an experienced and talented group of partners to lead the design and development of the Food Campus, including construction manager Shawmut Design and Construction, development adviser QPD, architect Jacobs, engineer Bohler Engineering, environmental adviser Ransom Consulting, and financial adviser Affirmative Investments. In addition, the law firms Brown Rudnick LLP and Greenberg Traurig LLP provided pro bono legal services for the project. The project’s lenders include Cambridge Savings Bank, City of Boston, Low Income Investment Fund, Nonprofit Finance Fund, PNC Financial Services Group, and the Property and Casualty Initiative. The federal New Markets Tax Credits program and the federal Healthy Food Finance Initiative are critical components of the project financing. impactful hiring plans and job-training programs,” said Kirsten Shaw, director of the northeastern region for the Low Income Investment Fund in New York. For more information about the project and how to support the Food is the Foundation capital campaign, please visit www.servings.org/foodisthefoundation. Community Servings is a not-for-profit organization with a 28-year history of providing medically tailored meals and nutrition services to individuals and families coping with critical and chronic illnesses like HIV/AIDS, cancer, kidney disease, diabetes, heart disease, and others. The meals are made-from-scratch and home-delivered, sending the message to those in greatest need that someone cares. Community Servings helps its clients maintain their health and dignity and preserve the integrity of their families through free, culturally appropriate meals, nutrition education and counseling, and other community programs. For more information, visit www.servings.org.